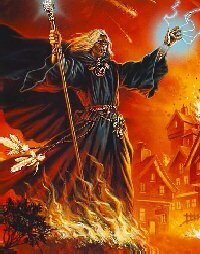 As the powers of the Necromancer are varied and vast, so are the spells of the necromantic forms. Purely magical in nature and deadly by design, the Necromancers' spells serve to make them formidable opponents. As a Necromancer, you may choose which spell schools to devote your study to, becoming more and more powerful as your ascendancy in your chosen schools rises. You may train your magical energies in the following schools of magic: Edged, Crushing, Cold, Flame, Psionic, Lightning, Corrosion, Virulence, Power, and Light.